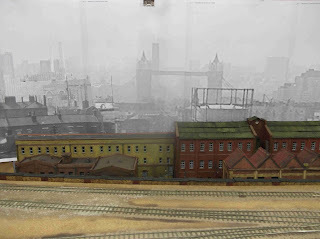 Most of the meeting was spent preparing for the next outing of Lighterman's Yard - Chatham in June. 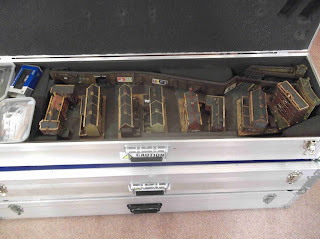 As usual, Pete Townsend arrived with a few new buildings to add to the layout. 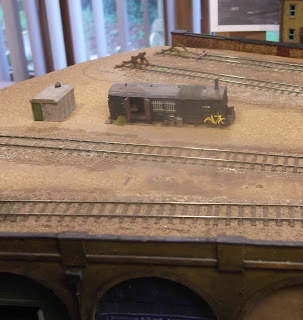 Richard had completed the first draft of the backscene, which was temporarily propped in place to see how well it fitted the rest of the layout. Keith had lowered the top of the viewing window. A closer view of part of the the backscene. The intention in the final version is to have a little more colour, but fading and blurring in the distance. 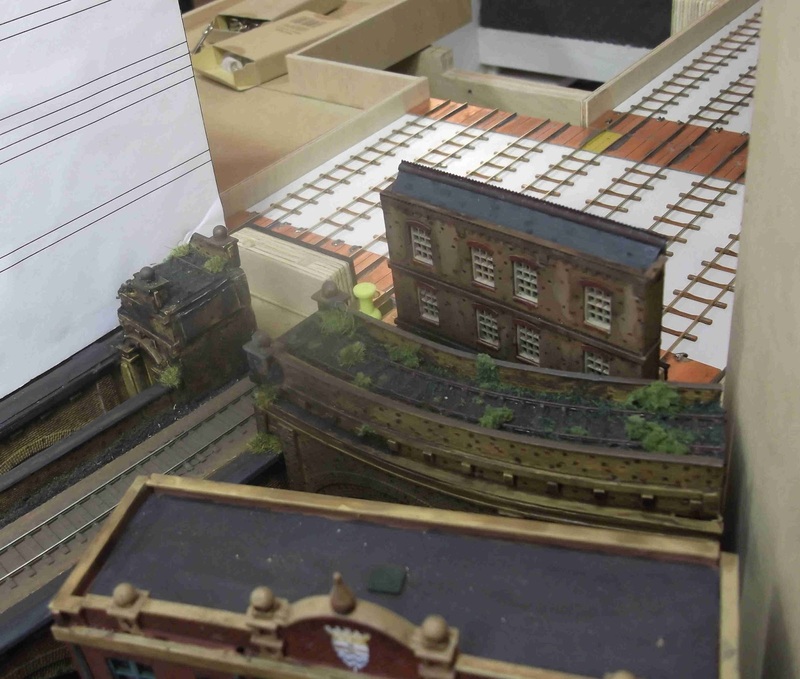 The mechanism for curving it around each end of the layout is still under discussion. 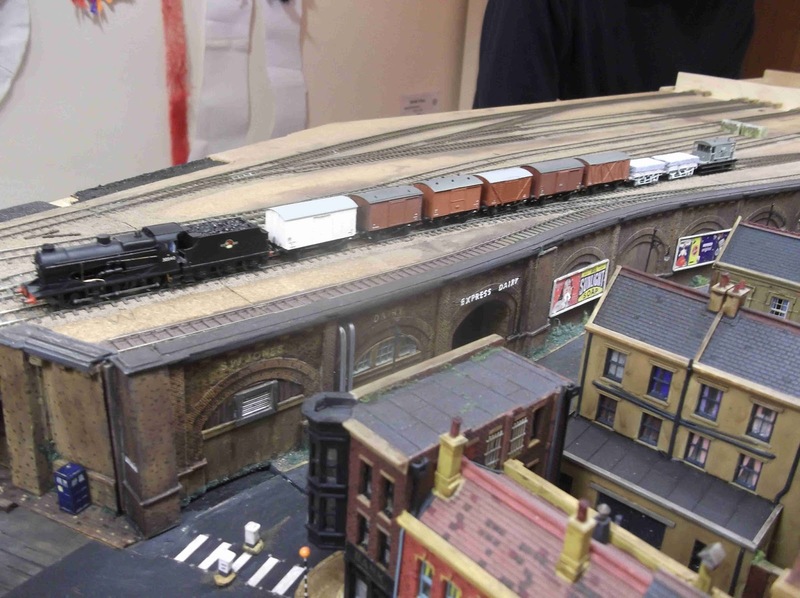 Pete Townsend had torn down one of the blocks of flats at the end of the layout, replacing it with a viaduct carrying a disused railway , together with an unspecified building. This change is intended to provide a better scenic break in front of the fiddle yard/traverser. 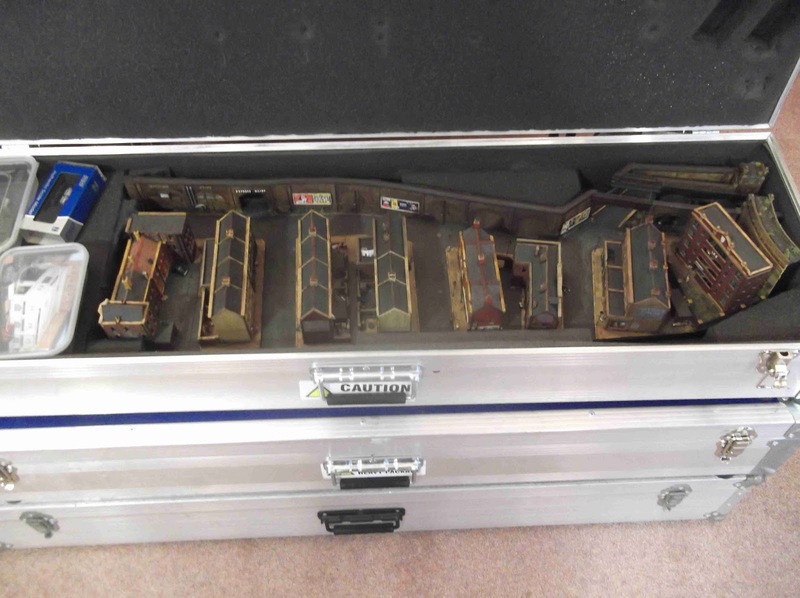 Unfortunately the two alternative bridges he provided were both too low, blocking access... Back to the drawing board! 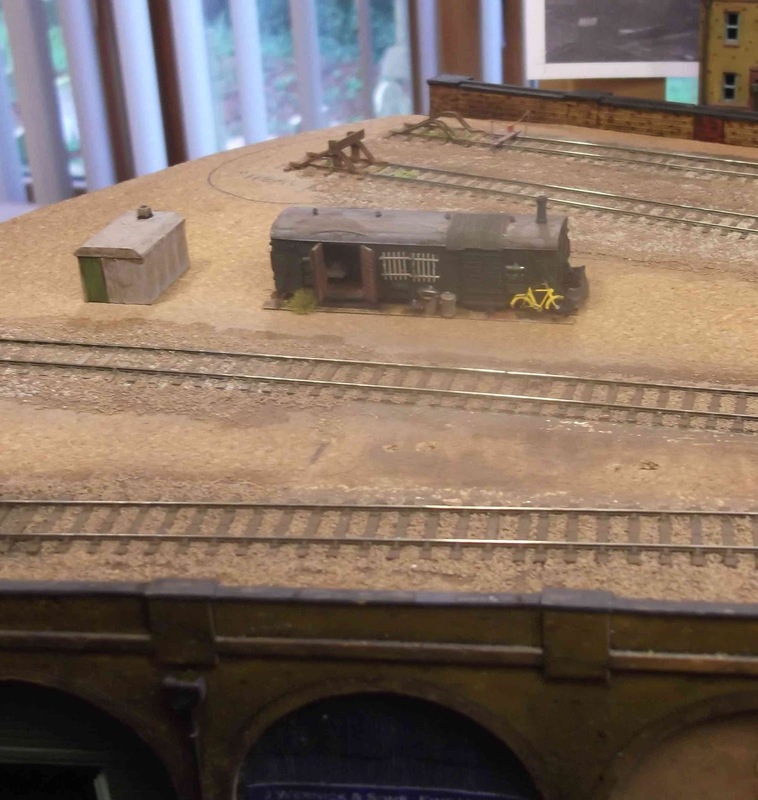 David Smith is building a water tank and coaling stage, but was absent today (apparently driving 305mm:foot trains). Next extension to the buildings will probably be a small dairy. One of the arches in the viaduct has been opened up, providing access for milk floats. 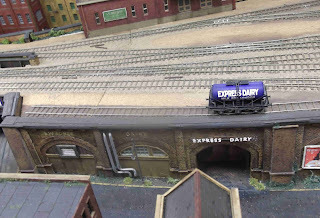 Pipework will be added to transfer milk from tankers on the railway siding above. One of Keith's locos bringing in a mixed freight train, to allow other operators to practice shunting (and to check the track for faults - none found). 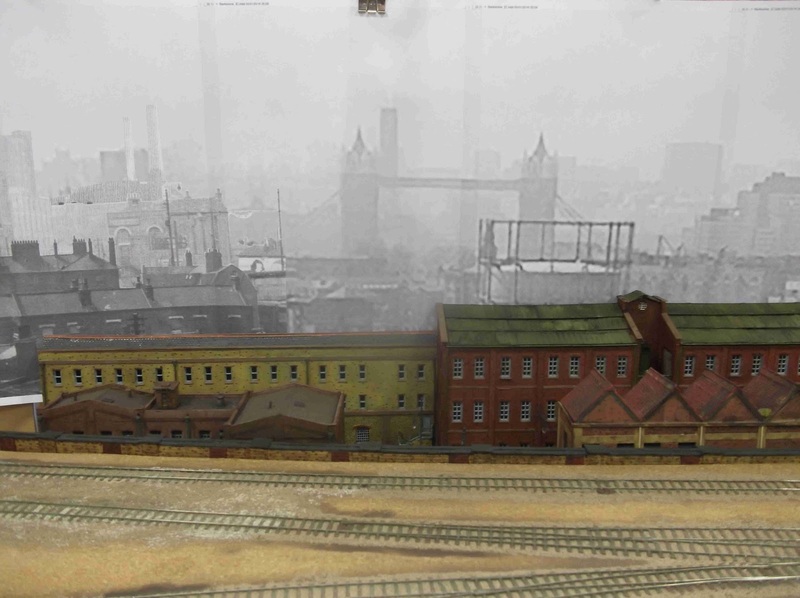 The backscene had been removed again, as few of the operators are tall enough to see over it!